CJM VR38 FPD Rails offer industry leading volume with their large 11/16" bore. Each end is threaded for -8AN, but can be supplied with -6AN reducers where needed (as shown above). The fittings use bonded seal washers, providing the seal qualities of an o-ring, combined with the torquing surface area of a crush washer. These rails can be plumbed in series or parallel. With our optional full -8 mandrel bend cross-over hose (see bottom photo), the horsepower ceiling for series plumbing is raised by the CJM VR38 FPD Rails. 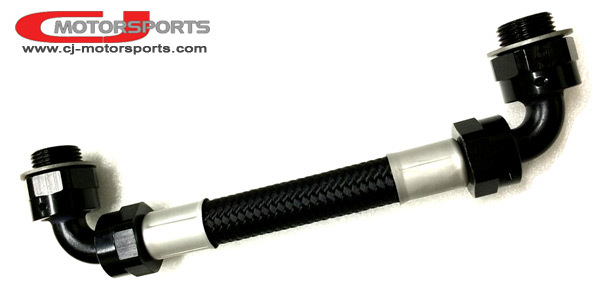 As the name suggests, the CJM FPD rails use OEM Nissan Fuel Pulsation Dampers. Nissan put them there for a reason! Enhanced part throttle drive-ability is realized, improving the driving experience while smoothing out your fuel tables. The FPDs are secured to the CJM rails with precision, laser-cut, stainless steel clamps. Included are stainless steel cap-screws to secure the rails to your VR38DETT atop a set of chrome spacers. A fresh pair of Nissan FPDs are a default included option, but you may select to remove one or both. 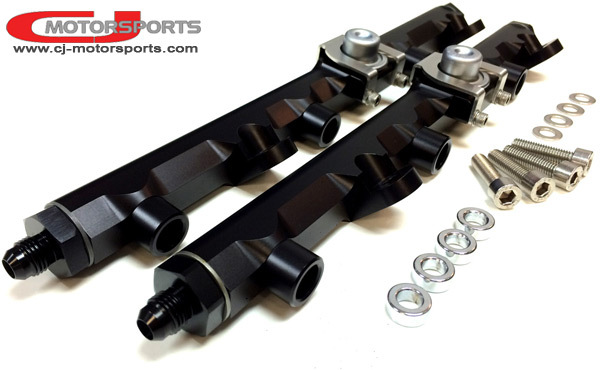 Of the 3 dampers factory installed to your GT-R, one of them is compatible with the CJM rails if you wish to re-use it. Plumbing Recommendations: At the rear of the rails, there is plenty of space for -6an or -8an. At the front of the rails, -8an hose ends must thread directly into the rail to clear the timing chain cover (see our optional cross-over hose for example). If you wish to plumb in series, use our cross-over for guaranteed fit.